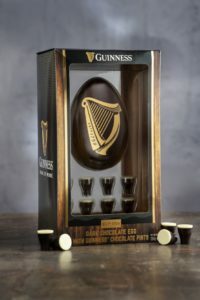 With six days left until the biggest chocolate binging day of the year, followed closely by Christmas and Halloween, Easter Sunday is giving us all kinds of egg inspirations, but Guinness has topped our lists this year with their newest release, a dark chocolate Guinness Egg with mini chocolate Guinness pints. Heaven! Easter only means two things to us, chocolate and more chocolate, and Guinness have answered our prayers. We've seen all kinds of eggs making their way through the wood work over the last few weeks, but Guinness have definitely topped the table with their reasonably priced egg, with mini Guinness pints that will surely be eaten all in one sitting. The egg itself, is a whopping 230g of deliciously blended dark chocolate with hints of that creamy Guinness flavour we all know so well. Not only that, but the eight mini Guinness pints really push it over the edge, awarding us with tiny dark and white chocolate bites, filled with a Guinness flavoured centre. Unreal! For those of you who are sold and want to go find the egg for yourself, don't worry you won't have to hunt it down as it's available in most Tescos, Dunnes, Supervalu, Londis, Eurospar and Mace stores near you for only 13 yoyos. If you're looking to find some more boozy treats for your wild Sunday night of choco-loading, then I would recommend getting your hands on Jagermeister's latest creation. Jagermeister have come up with their own 38g boozy styled, jager-infused creme egg that are apparently creamier than your usual creme egg, with a finer, more crisp choclolate shell, but I think we'll have to judge that for ourselves..
You can find them here, on the Jagermeister website.